I have an Inspiron 7567. Been reading the forums to educate myself of any quirks or design considerations for this laptop as it's a bit different than the SATA-only laptops I've worked with in the past. This particular model has a Toshiba m.2 512GB NVMe (PCIe-x4) SSD. 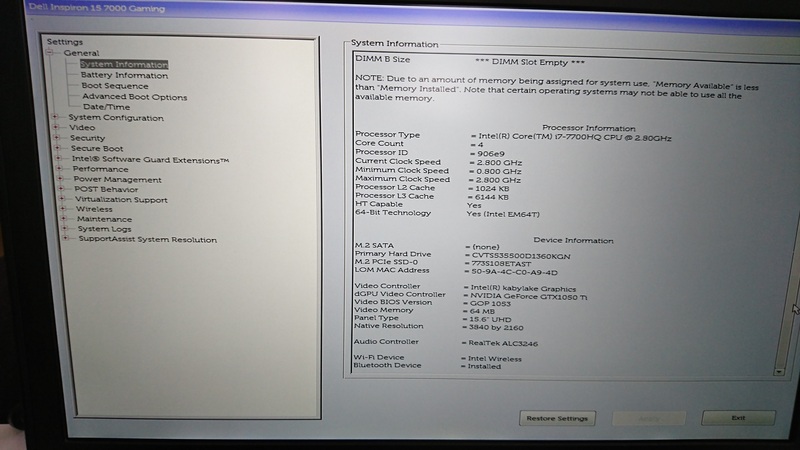 Bios is configured for AHCI mode, not RAID. NVMe driver is presently Toshiba's RD400 driver v1.2.126.843. AHCI driver is presently Intel's iaStorA (AHCI) driver v15.2.0.1020. That said, there's an empty standard 2.5" SATA slot in the laptop I want to take advantage of since m.2 + HDD was not a configuration option at purchase. Which is fine, I have several spare HDDs to choose from. If I install a SSD in the SATA slot, the drive is not recognized, intel's utility shows "Internal Empty Port 1"
Can anyone shine light on why this might be the case? I've never seen a SATA controller in SATA mode not accept literally any drive it has been interfaced with. I don't understand why the underlying type of drive would impact what was sitting behind the physical communications interface. On the Seagate that is working in the BIOS, do you know what it's formatted as? That's the only thing I can think of... Also, on the Crucial drive was it ever formatted or fresh too? Sorry on the silly questions, but this is pretty interesting since the Seagate is working.. This is out of scope, but I will see if I can find anything that helps. I should at least be able to see that something is connected even if it's in an unreadable format. The Intel SSD should have shown up with no format in diskpart, and easily partitioned and formatted. I will still see if I find anything on my end. Sure, see the transcript below of formatting the Intel SSD. After performing this, I put it back in the 7567 and it does not show up in BIOS or Windows. Screenshots below. DiskPart successfully formatted the volume. 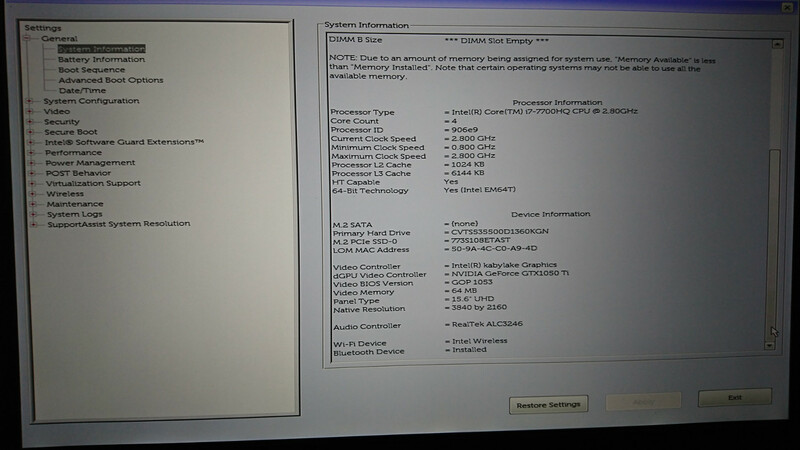 Thanks for the update, I know this will probably cause Windows to not boot (while enabled), but can you change from AHCI to RAID in the BIOS and then restart to see if the 2nd drive is found in the BIOS? I am including the Diskpart listing from my system with a 250 GB data 2.5 inch drive and a 500 GB Samsung 960 EV0 M.2 PCIE drive. I will be back in about 12 hours to see if I can help. We did have one thread where someone with an older SSD had to replace it with a newer one. I do not know your situation regarding the SSD you are using, but some of the size numbers look a little strange.. Maybe BitLocker is involved in that. This is a very strange case, and like the OP I have never seen the type of physical storage medium make a difference as to whether the drive is detected at all at the BIOS level. Just to gather another data point in addition to Brad's suggestion, what happens if you physically remove the NVMe SSD? Does that allow the BIOS to detect the SATA SSDs? Thanks for the good questions. Here's what I've put together. First, acknowledging a mistake. If we go back to the above picture, the "Primary Hard Drive" attribute is the Intel SATA SSD's serial number "CVTS535500D1360KGN." When I removed it, the PHD attribute said (none). When I connected the Crucial the PHD attribute changed to "13280944E1E9." In all cases BIOS is seeing the drive. This appears to be an honest mistake on my part; I misread what was on the screen, interpreting the "Primary Hard Drive" as the serial number of the NVMe disk, when it's reporting the serial number of the attached SATA drive instead. It is confusing. I would have thought the attribute would report the SATA drive model number instead. The PCIe attribute is also the serial number of the NVMe drive. If I could be so bold as to suggest correcting that in a future BIOS update to make it more clear and report both attributes, the model & serial, per connector. At Brad-L's suggestion I put the Intel controller back in "RAID On" mode. Prior to this, I had made the steps to install the correct RAID & AHCI drivers, knowing this was a likely path of troubleshooting. 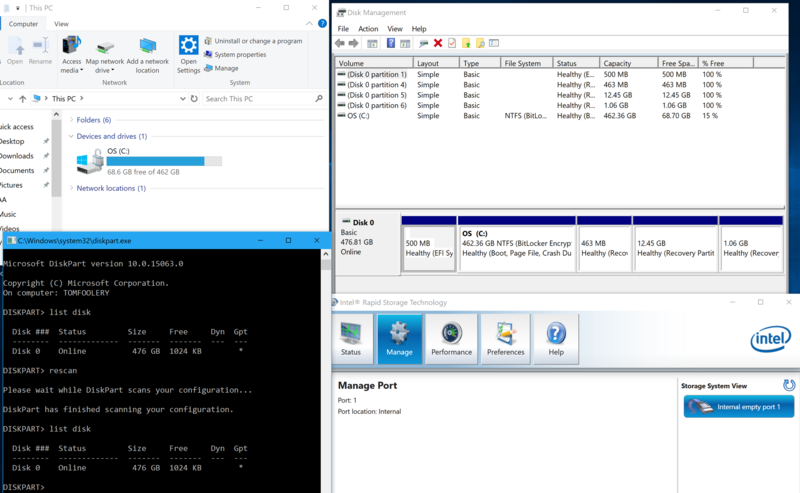 After switching back to RAID On, Windows booted normally, the NVMe disk name changed, and the Toshiba storage controller driver was replaced with the Intel Raid Controller. 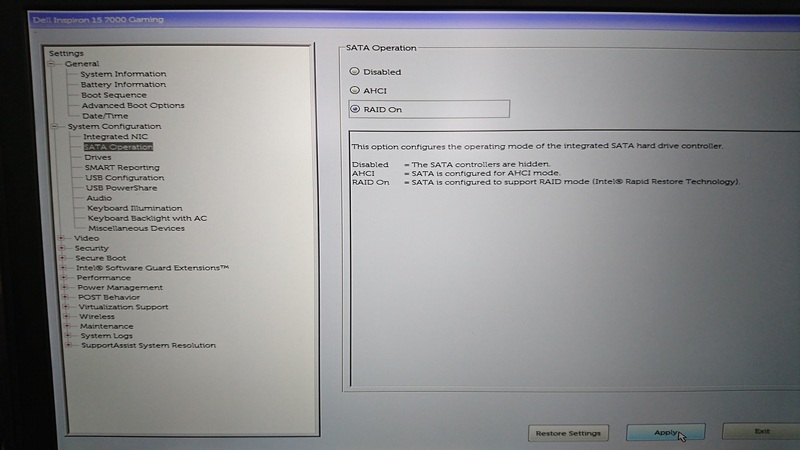 Note the empty SATA Connector on the Intel Rapid Storage Technology Manager. 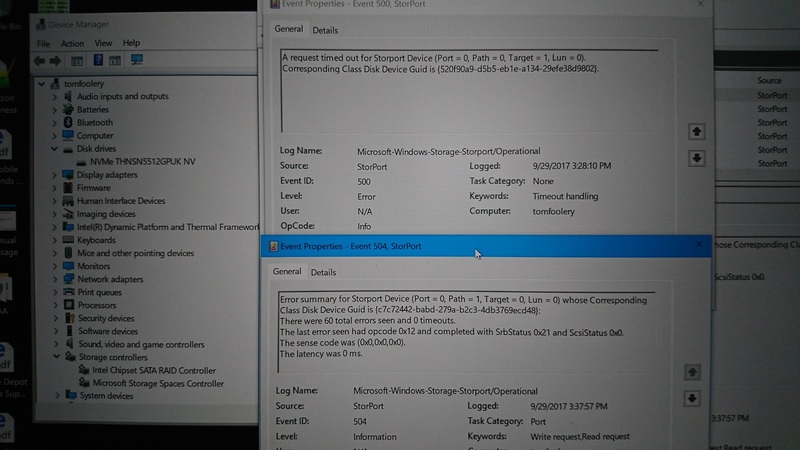 Interestingly, for about ~60 seconds, the Intel SATA SSD appeared in the device manager. I attempted to take a picture, but I was too slow to take a photo, it disappeared. I went to the event viewer and the it reported failure to communicate with device and errored out, the disk was dropped by Windows. 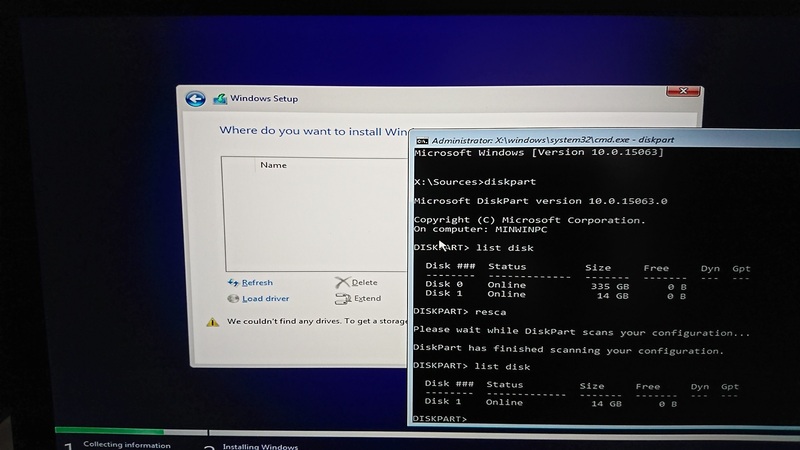 So to eliminate whether or not it's just my Windows installation or something else - I made a bootable Windows 10 1703 USB installer. I disabled Secure Boot so I could boot from the USB stick. Taking JPHUGHAN's advice, I removed the NVMe drive, left Intel SATA mode is RAID On, leaving only the Intel SSD is installed. 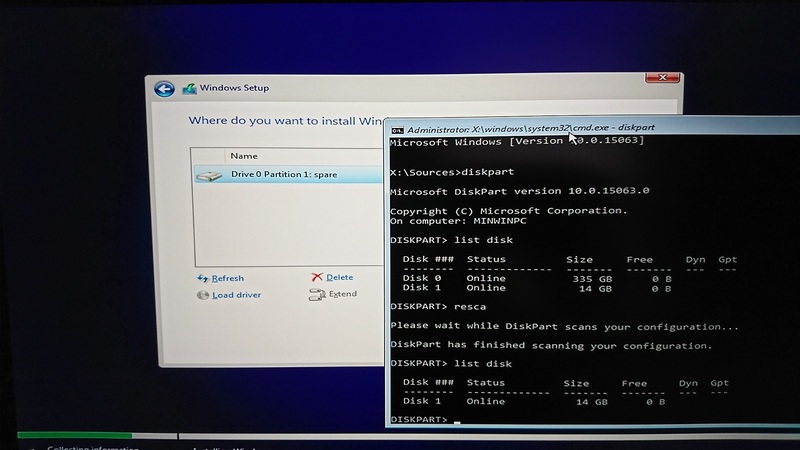 When I get to the drive selection list, it's empty, so I chose the "Load Driver" option, loaded the boot driver for the Intel Controller, it detected correctly, however the SSD drive is not detected. Reboot, start over again with the Crucial drive, same result. I didn't photo the Crucial results for brevity. As this test reveals, I didn't need to install the Intel RAID in the first place, but I did so anyway since no drives were listed - and I had no way to know whether or not the driver was loaded simply by looking at an empty device selection list. 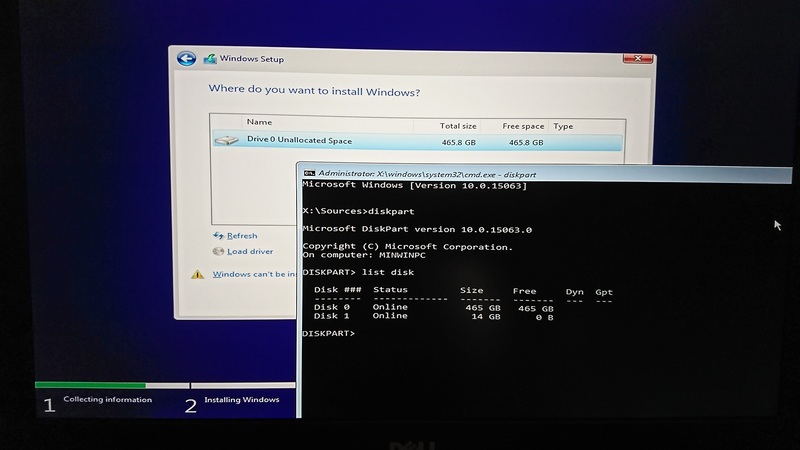 I'm going to test installation of Windows to the HDD to eliminate the disappearing act the SSDs have. SO - Windows can't see (use?) 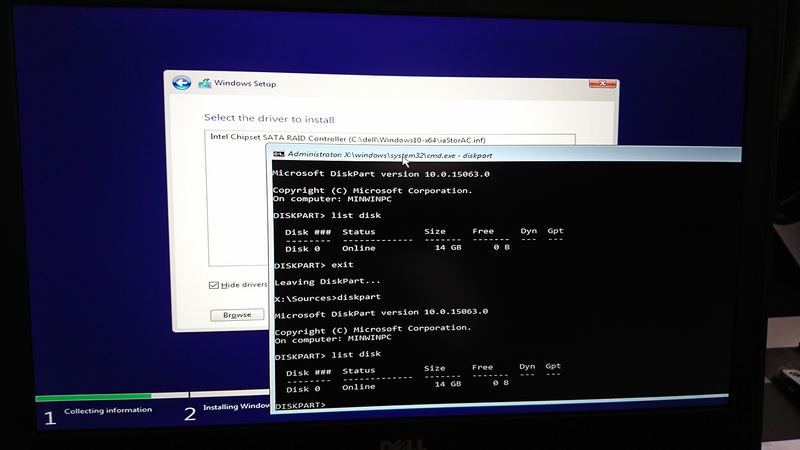 SSD drives in the SATA slot during installation or during normal Windows operation. I'll post this message as it's long already and follow up with what happens when I go back to AHCI mode. Switched back to AHCI mode. Installed the Intel SSD, left the NVMe drive disconnected. Reproduced the problem exactly as described earlier, but I caught the drive disappearing. 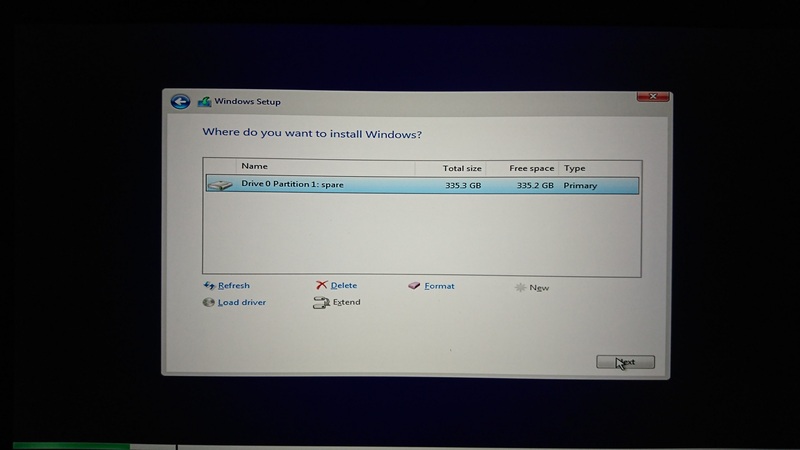 Boot to Win10 1703 installer, windows sees the SSD. 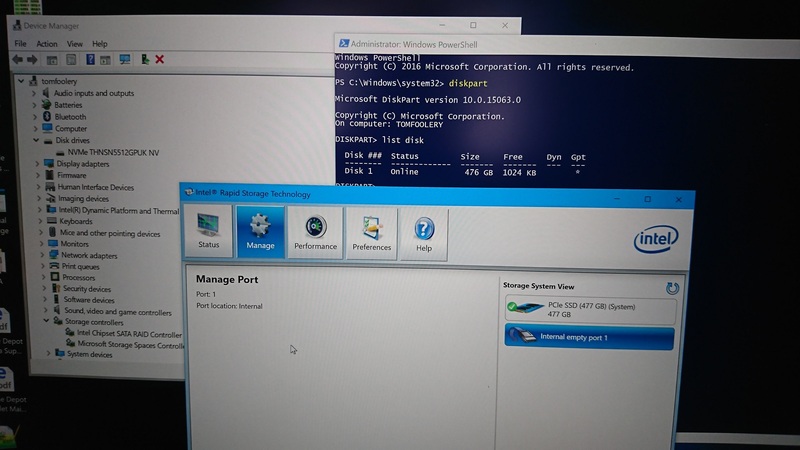 I SHIFT+F10 to open the command prompt, run diskpart to show the drive, make sure it's reporting correctly. It appears to do so. Then I issue a "rescan" command and relist the drive. It has disappeared. I refresh the windows installer drive selection window, and the drive is now gone. I brought the command prompt back in front.